In Laos, there is little to no legitimate agricultural support for farmers. Often, agricultural training is offered by big companies whose agenda focuses on quantity and not quality coffee production. Many pest, diseases and clean processing issues exist but farmers severely lack access to reliable methods for identifying these problems, let alone solve them. Data-driven analysis put in place by Filanthrope and Jhai Coffee House identify farm health, process, and production issues which allows the cooperative to understand and identify specific villages and in some cases farm-specific issues concerning pests, disease, pulper damage, fermentation errors, soil malnutrition, and other critical coffee related issues. With this data, we target and implement effective agricultural training and crisis-response programs, which focus on the true need of each village rather than broad, potentially wasteful or unrrleated programs. Some examples of JCFC equipment and strategies for improving quality are located below. RipE Picking. 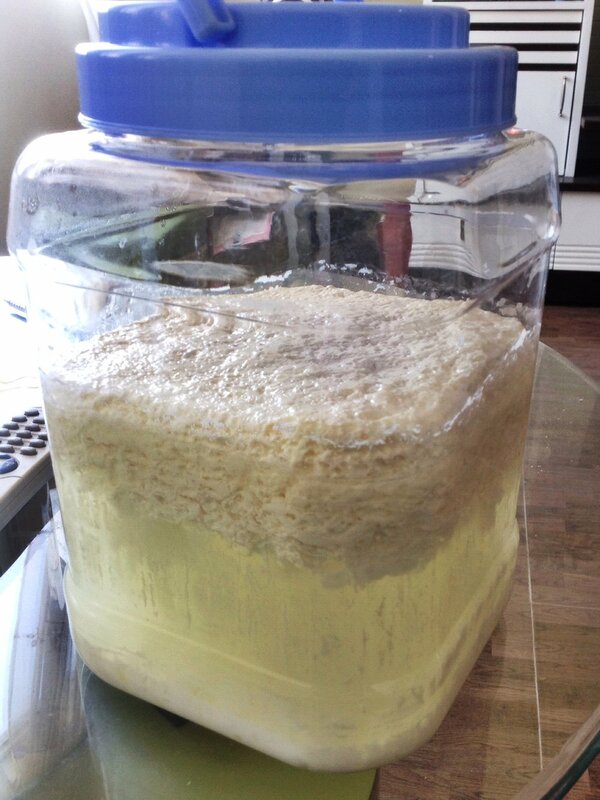 Clean Fermenting. Wet Processing. Parchment management. Correct Bagging. There are more than 100 quality control checks necessary to produce SCA quality coffee before it leaves the JCFC warehouse. This makes coffee one of, if not the most, humanized beverages on the planet! In order for the JCFC to understand why they are putting in all the attention to detail and work they've never done in the past, one example of training involved the design and sharing of pictographs showing the unintended results of errors in the coffee production process; plus, each defect is roasted and the farmers are able to learn what each defect tastes like when brewed. Please click here to see the full set of pictures. Overripe Cherries? Tastes like vinegar or fermented fruits. Forget to Float/Sink Cherries? Tastes like cardboard. Dirty Cherries Before Pulping? Tastes like dirt. Dirty Pulper? Tastes like cow manure. Dirty Fermentation Tank? Tastes like dirt and beef stew. Forget to stir during fermentation? Tastes like garlic and soy sauce. Ferment too long or too short? Tastes like vinegar and onions. Dirty Drying Tables? Tastes like dirt, tobacco, and mold. Forget to stir your parchment? Tastes like hay, cardboard, and onions. Parchment is stored above 12% moisture? Tastes like mold and wood. 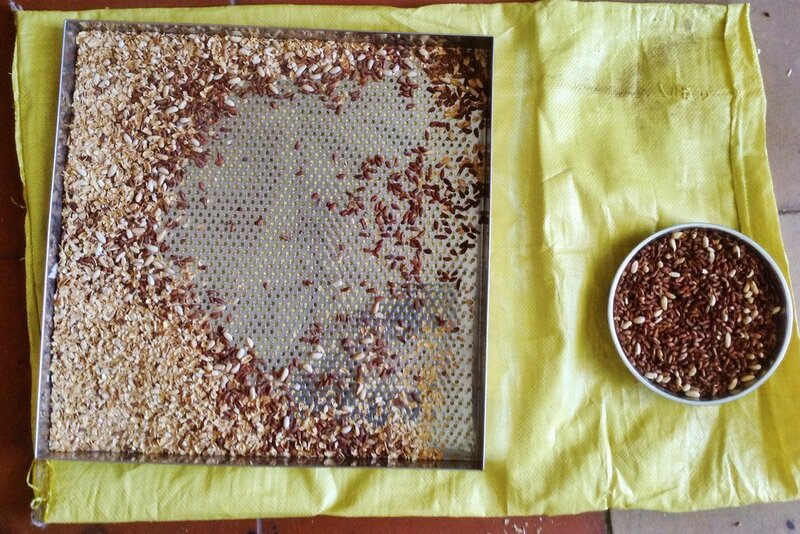 Parchment is dried below 9% moisture? Floral and fruity aromas disappear. Tastes flat. Parchment is stored near fire smoke, gasoline, kitchens, etc.? Tastes like smoke, gasoline, food. The goal of the cherry picking paddles is to help farmers understand that just because they have picked red cherries it does not mean that they are fully ripe with maximized sugar development. Each paddle consists of 50 holes, where each hole represents 2% of the pick. By placing a cherry in each hole and then moving them around by color and hard/softness, farmers can identify the percentage or ripe, overripe and unripe. When we ran the experiments in each farm, we found that most paddles had on average two rows (10 cherries or 20%) which were either very hard, underripe, or too soft, overripe. From there, farmers tasted these underripe, ripe and overripe cherries to compare. Underripe cherries are comparable to eating an underripe green banana and overripe cherries produce a vinegar taste that is undesirable. Once farmers understood the differences in ripeness, Filanthrope was able to explain the monetary value for each ripeness stage of the coffee cherry so that they could understand that benefits of waiting for underripe cherries to ripen. This information alone significantly increased the value of the green bean and eliminated the loss of overripe fruit which can only be sold at low, defect prices. In the 2016/17 season, all JCFC pick teams painted their picking baskets a dark red color to remind them of what color of fruit is ripe. In the 2017/18 season, pick teams have expressed great excitement to paint their fingernails "coffee cherry red" during the harvest, which further reminds them to keep their eyes focused on the best cherries. Even a small farm trying to manage harvesting their coffee during the season can be quite a challenge. Quite literally, it is a race against time to harvest quickly enough so that the cherries do not become overripe and fall off the tree. Considering the fact that each village has a group of cooperative members, the cooperative has had to rethink its strategy. Rather than each farm work by itself, each family becomes part of a harvest team. Working together, the team can completely harvest a single or multiple farm/s (depending on the group and farm size) each day. The pick team rotates daily from farm to farm, ensuring all the day's ripe cherry is harvested. This spreads out the ripening period for farmers and ensures the maximum of ripe cherry is harvested from each farm. Cooperating together in this way allows for each farm to pick only ripe cherries as they pass through each teammate's farm. Since the team is able to harvest all of the day's ripe fruit, and avoid picking underripe fruit, farmers are able to avoid letting cherries ripen too long as well as allow for the underripe cherries to have more time to ripen until the next picking round. During the harvest, each farm is picked on average about 5 times and can increase the amount of good quality coffee by up to 30%. BRIX refractometers allows the picking-team leader to test the sugar content of fruits to determine the optimally ripe cherries. Comparing color, cherry hardness, and BRIX variables allows the picking-team leader to determine what color is best for the team to pick for that day/farm/variety. The paw-kit water activity meter allows for Filanthrope and Jhai Coffee House to test the stability of "free" water inside each bag of coffee. Ensuring that this number is between 0.50-0.60 before secondary processing the green beans and vacuum-packing them is very crucial to create coffees which will stay fresh longer, and age gracefully. JCFC villages also use UV lights to check parchment and green beans for mold, fading and other defects which are naked to the unassisted, human eye. The JCFC has access to 10 moisture meters. Green coffee udner UV radation. Glowing beans are defective. It is true that all human life lives in the top 15cm of soil, called topsoil. Topsoil is where all plants and animals survive. Soil is not an inert substance; it is teeming with microorganisms which create a diverse ecology that keeps the fabric of life woven together. Indeed, when coffee is harvested and exported, quite literally, soil is being exported; therefore, we must return the nutrition back to the soil to keep it healthy and productive. Sustainable soil is not based on whether land can produce coffee, but whether it can be productive in perpetuity regardless of what is grown. When petrochemical fertilizers are used, the microbiology of soil begins to die off. A complex symbiotic relationship between plant and soil exists, but when petrochemical fertilizers are used, the soil microbes become useless and die off. Additionally, when these fertilizers are used, plants lose their ability to effectively maintain their own defenses against pests and diseases. Have you noticed that organic tomatoes taste different than conventional? This taste difference is the tomato plants lack of producing its own defense (e.g. phenolic compounds) which is what gives tomatoes that delicious flavor. As such, the JCFC has come to understand the importance of healthy, living soil. Soil is their savings account. They must keep the soil healthy, fed, and alive. The best defense, is a good offense. In this case, the best offense is healthy, living soil. The benefits of and training of cooperative programs include organic composting (mesophilic and thermophilic, controlled microbial composting), practical soil and plant biology, nutrient deficiency identification, indigenous microbe cultivation, nitrogen ground cover, leguminous shade trees, replanting native forest plants, establishing mix-crops (moringa oleifera, jackfruit, oranges, bananas, taro, cassava, etc.). These techniques are far beyond simple "organic" food production and fall more under the term of agro-ecology. For example, when petrochemicals are used, a specific set of fungi called Vascular Arbuscular Myccorhizae (VAM) cease to exist. In a healthy, organic soil, these fungi form a symbiotic relationship with tree, notably coffee tree, roots. The fungi enters the roots of the coffee tree and can link with the VAM of other trees, creating one large living organism that can span acres! This connectivity can increase the effective root system of a coffee tree by up to 10,000% In addition to these fungi, a vast range of bacteria and other fungi are important for the transport of nutrition from the soil to the plant as well as triggering plants to produce their own defense mechanisms against diseases and pests. A wonderful example of how traceability and transparency is benefiting certain villages is with the pest called the berry borer, which in certain villages wiped out nearly 30% of the crop in 2015/16. By measuring defect percentages and green bean outturn, we were able to identify which villages had no issues, which villages had minor problems, and which villages had a berry borer epidemic. With this data, we were able to establish a berry borer control program to halt and begin the reversal of the damages done by the berry borer pest. Most of the coffee world uses a harmful chemical called endosulfan to combat berry borer traps with limited efficacy. 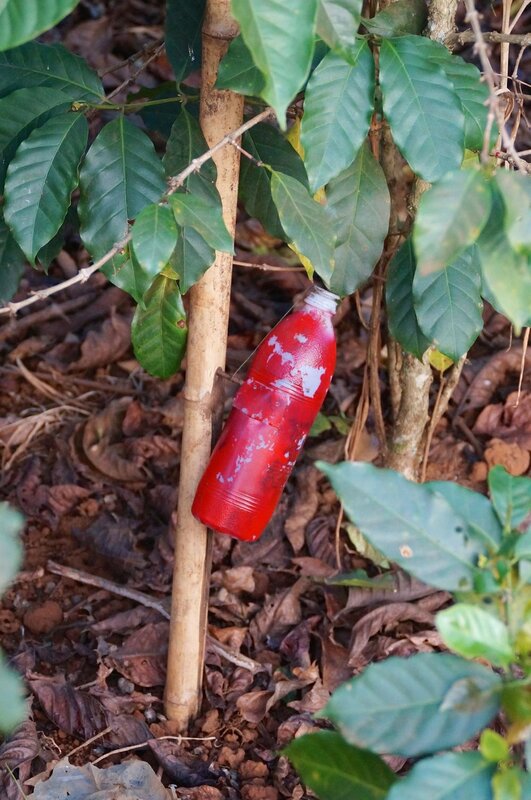 In the JCFC, bait traps are constructed at a cost of $0.12 per trap using a lure containing equal parts methanol and ethanol (which mimics the aroma of an overripe coffee cherry, a gustatory delight for the female berry borer) and repurposed plastic water bottle containing soapy water in the bottom. As the berry borer is attracted to the smell, they enter the bottle and get trapped in the soapy liquid. These traps are effective and highlight the problems worldwide in coffee production where good, proven scientific research rarely reaches those who need it. Further pest and disease control programs include the production and use of regionally-produced neem oil and neem cake, Bauveria Bassiana, effective indigenous microorganism preparations, plant extract teas, Indian panchakavvya, chitosan emulsions, lactic acid bacteria preparations, soya bean soap sprays, and more. During the 2016/17 season, Vibrant Village understood the necessity for smaller capacity production for the JCFC. A small-scale parchment peeler-polisher machine and a nitrogen-flush, vacuum-packing machine was granted to the JCFC in order to better handle farmer-by-farmer, village-by-village production rather than being forced to blend all coffees into one homegenous lot. This ability as greatly enhanced the ability of the JCFC to keep small, but special, lots separate for coffee drinkers to enjoy. The main benefit of these machines is that the JCFC can process as little as 25kg of coffee (1 bag of coffee parchment) without losing traceability. An additional benefit is that this machine does not overheat like many other peeling/polishing machines sold in the world. This ensures that the JCFC does not damage the coffee and help the coffee stay fresher, longer. Vacuum-sealing technology allows the JCFC to send coffee to the furthest corners of the world in a no-oxygen environment. This means that no bacteria or mold can grow, thus destroying what was once a beautiful, special coffee. With the addition of nitrogen flushing (an inert gas), we can further ensure that the coffees are packed in a no-oxygen environment. This is an example of the finished product. Each box of coffee from the JCFC is packed in 2 bricks of 12.5kg/brick, giving you a total of 25kg of nitrogen-flushed, vacuum-packed green beans.